خیرخواه, امیرسامان, نویدی, حمیدرضا, مسی بیدگلی, معصومه. (1396). مدلسازی عدم تقارن اطلاعات در مساله حمله به شبکه حمل و نقل مواد خطرناک. 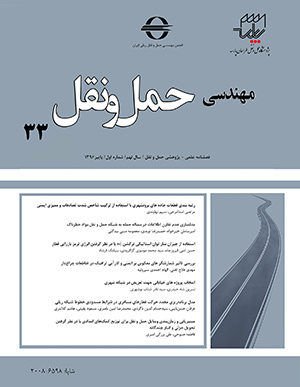 فصلنامه علمی - پژوهشی مهندسی حمل و نقل, 9(1), 17-36. امیرسامان خیرخواه; حمیدرضا نویدی; معصومه مسی بیدگلی. "مدلسازی عدم تقارن اطلاعات در مساله حمله به شبکه حمل و نقل مواد خطرناک". فصلنامه علمی - پژوهشی مهندسی حمل و نقل, 9, 1, 1396, 17-36. خیرخواه, امیرسامان, نویدی, حمیدرضا, مسی بیدگلی, معصومه. (1396). 'مدلسازی عدم تقارن اطلاعات در مساله حمله به شبکه حمل و نقل مواد خطرناک', فصلنامه علمی - پژوهشی مهندسی حمل و نقل, 9(1), pp. 17-36. خیرخواه, امیرسامان, نویدی, حمیدرضا, مسی بیدگلی, معصومه. مدلسازی عدم تقارن اطلاعات در مساله حمله به شبکه حمل و نقل مواد خطرناک. فصلنامه علمی - پژوهشی مهندسی حمل و نقل, 1396; 9(1): 17-36. در این مقاله، مساله توزیع مواد خطرناک در شرایطی مورد بررسی قرار می‏گیرد که در آن از یک سو، توزیع‏کننده درصدد انتخاب مسیرهای اقتصادی با کمترین هزینه بر روی شبکه است و از سوی دیگر به منظور افزایش ایمنی حمل مواد خطرناک، آژانسی نظارتی به عنوان مهاجم، در صدد است که تصمیم توزیع‏کننده برای عبور از کمان‏های شبکه را تحت کنترل قراردهد و در صورتی‏که توزیع‏کننده از این کمان‏ها عبور نماید، از وی جریمه دریافت نماید. در این تحقیق، تعارض موجود بین دو تصمیم‏گیرنده در حالتی‏که آن‏ها درک یکسانی از اطلاعات شبکه ندارند، در قالب مدلی دوسطحی مدلسازی می‏شود. از آنجا که چنین مساله‏ای از نوع مسایل محاسباتی دشوار محسوب می‏شود و روش‏های دقیق برای حل این مسایل زمانبر است، دو الگوریتم فراابتکاری دوسطحی برای حل مساله توسعه داده می‏شود. همچنین به کمک نتایج حاصل از حل مسایل تصادفی در ابعاد مختلف، کارآیی الگوریتم‏های پیشنهادی در مقایسه با یکدیگر تحلیل می‌شوند. Akgün, İ., Tansel, B. Ç. and Wood, R. K. (2011) “The multi-terminal maximum-flow network-interdiction problem”, European Journal of Operational Research, Vol. 211, No.2, pp. 241-251. -Aksen, D. and Aras, N. (2012) “Abilevel fixed charge location model for facilities under imminent attack”, Computer and operation research, Vol.39, No.7, pp.1364-1381. -Apostolakis G. and Lemon, D. (2005) “A screening methodology for the identification and ranking of infrastructures vulnerability due to terrorism”, Risk Analysis, Vol. 25, No.1, pp.361–76. -Bard, J. (1998) “Practical Bilevel Optimization: Algorithms and Applications”, Kluwer Academic Publishers, Norwell, MA. -Bayrak, H. and Bailey, M. D. (2008) “Shortest path network interdiction with asymmetric information”, Networks, Vol.52, No.3, pp. 133-140. -Brown, G., Carlyle, M., Salmeron, J. and Wood, K. (2007) “Defending critical infrastructure”, Interfaces, Vol. 36, No.6, pp.530–44. -Claudio, M., Rocco, S., Ramirez-Marquez J. E., Daniel E. and Salazar, A. (2010) “Bi and tri-objective optimization in the deterministic network interdiction problem”, Reliability Engineering and System Safety, 95, pp. 887–896. -Colson, P. M. B. and Savard, G. (2005) “Bilevel programming: a survey”, 4OR, vol.3, 87–107. -Cormican, K. J., Morton, D. P. and Wood, R. K. (1998) “Stochastic network interdiction”, Operations Research, Vol.46, No.2, pp. 184-197. -Dai, Y. and Poh, K. (2002, December) “Solving the network interdiction problem with genetic algorithms”, In Proceedings of the fourth Asia-Pacific conference on industrial engineering and management system, Taipei, pp. 18-20. -Dempe, Stephan (2002) “Foundations of bi-level programming”, Kluwer Academic Publisher. - Dimitrov, N. B., Gonzalez, M. A., Michalopoulos, D. P., Morton, D. P., Nehme, M. V., Popova, E. and Thoreson, G. G. (2008, November). Interdiction modeling for smuggled nuclear material”, In Proceedings of the 49th annual meeting of the Institute of Nuclear Materials Management. -EKsioglu.B., Vural, A. V. and Reisman, A. (2009) “The vehicle routing problem: A taxonomic review”, Computers and Industrial Engineering, Vol.57, No.4, pp. 1472-1483. -Erkut, E. and Gzara, F. (2008) “Solving the hazmat transport network design problem”, Computers and Operations Research, Vol.35, No.7, pp. 2234-2247. -Garg, M. and Smith, C. (2008) “Models and algorithms for the design of survivable multi-commodity flow networks with general failure scenarios”, Omega; Vol.36, pp.1057–71. -Granata, D., Steeger, G. and Rebennack. S. (2013) “Network interdiction via a Critical Disruption Path: Branch-and-Price algorithms”, Computers and Operations Research, Vol.40, No.11, pp. 2689-2702. -Hodgson, M. J., Rosing, K. E. and Zhang, J. (1996) “Locating Vehicle Inspection Stations to Protect a Transportation Network”, Geographical Analysis, Vol.28, pp. 299–314. -Israeli, E. and Wood, R. K. (2002) “Shortest path network interdiction”, Networks, Vol.40, No.2, pp. 97-111. -Kara, B. Y. and Verter, V. (2004) '“Designing a road network for hazardous materials transportation”, Transportation Science, Vol. 38, No.2, pp. 188–196. -Kennedy, K. T., Deckro, R. F., Moore, J. T. and Hopkinson, K. M. (2011) “Nodal interdiction”, Mathematical and Computer Modeling, Vol. 54, No.11, pp. 3116-3125. -Kevin T. Kennedy, Richard F. Deckro, James T. Moore, Kenneth M. Hopkinson, (2011) “Nodal interdiction”, Mathematical and Computer Modeling, Vol. 54, pp. 3116–3125. -Kheirkhah, A., Navidi, H. and Messi Bidgoli, M. (2015) “A bi-level network interdiction model for solving the hazmat routing problem”, International Journal of Production Research, (ahead-of-print), pp. 1-13, DOI:10.1080/00207543.2015.1084061. -Laporte, G. (1992) “The vehicle routing problem: An overview of exact and approximate algorithms”, European journal of operational research, Vol. 59, pp. 345–358. -Legillon, F., Liefooghe, A. and Talbi, E. (2012, June) “Cobra: A cooperative co-evolutionary algorithm for bi-level optimization”, In Evolutionary Computation (CEC), 2012 IEEE Congress , pp. 1-8. -Lim C. and Smith J. (2007) “Algorithms for discrete and continuous multi-commodity flow network interdiction problems”, IIE Transactions; 39, pp. 15–26. [Special issue on Homeland Security]. -McMasters, A. and Mustin, T. (1970) “Optimal interdiction of a supply network”, Naval Research Logistics Quarterly, Vol. 17, pp. 261–268. -Morton, D., Pan, F. and Saeger, K. (2007) “Models for nuclear smuggling interdiction”, IIE Transactions on Operations Engineering, Vol. 38, pp.3–14. -Oduguwa, V. and Roy, R. (2002) “Bi-level optimization using genetic algorithm”, IEEE International Conference on Artificial Intelligence Systems (ICAIS 2002), pp. 322–327. -Önal, H. (1993) “A modified simplex approach for solving bi-level linear programming problems”, European Journal of Operational Research, Vol. 67, No. 1, pp. 126-135. -Pan, F. (2005) “Stochastic network interdiction: models and methods”, Doctoral dissertation, The University of Texas at Austin. -Prince, M., Geunes, J. and Smith, C. (2013) “Procurement allocation planning with multiple suppliers under competition”, DOI: 10.1080/00207543.2013.807956. -Ramirez-Marquez, J. E. and Rocco, C. (2009) “Stochastic network interdiction optimization via capacitated network reliability modeling and probabilistic solution discovery”, Reliability Engineering and System Safety, Vol. 94, pp. 913–921. -Rocco, C. and Ramirez-Marquez, JE. (2009) “Deterministic network interdiction optimization via an evolutionary approach”, Reliability Engineering and System Safety, Vol. 94, No. 2, pp. 568–76. -Royset, J. O. and Wood, R. K. (2007) “Solving the bi-objective maximum-flow network-interdiction problem”, INFORMS Journal on Computing, Vol. 19, No. 2, pp. 175-184. -Salmeron, J., Wood, K. and Baldick, R. (2004), Analysis of electric grid security under terrorist thread”, IEEE Transaction on Power Systems, Vol. 19, No. 2, pp. 905-912. -Smith, J. C., Lim, C. and Sudargho, F. (2007), “Survivable network design under optimal and heuristic interdiction scenarios”, J. Glob Optim, Vol.38, pp. 181–199. -Steinrauf, R. L. (1991) “A Network Interdiction Model”, M.S. Thesis, Naval Postgraduate School, Monterey, CA. -Toth, P. and Vigo, D. (2001) An overview of vehicle routing problems”, In The vehicle routing problem, pp. 1-26. Society for Industrial and Applied Mathematics. -Washburn, A. and Wood, R. K. (1995) “Two-person zero-sum games for network inter diction”, Operations Research, Vol. 43, No. 2, pp. 243-251. -Washburn, A. and Wood, K. (1995) “Two-person zero-sum games for network interdiction”, Operations Research, Vol. 43, No. 2, pp. 243-251. -Wen, U. P. and Yang.Y. H. (1990) “Algorithms for solving the mixed integer two-level linear programming problem”, Computers and Operation Researches, Vol. 17, pp. 133–142. -Wood, R. K. (1993) “Deterministic network interdiction”, Mathematical and Computer Modeling, Vol. 17, No. 2, pp. 1-18. -Xie, Y., Lu, W., Wang, W. and Quadrifoglio, L. (2012) “A multimodal location and routing model for hazardous materials transportation”, Journal of hazardous materials, Vol. 227, pp. 135-141. -Zenklusen, R. (2010) “Network flow interdiction on planar graphs”, Discrete Applied Mathematics, Vol. 158, No. 13, pp. 1441-1455.